VOAD associations improve outcomes for people affected by disasters by facilitating cooperation, communication, coordination, and collaboration among nonprofit organizations, community-based groups, government agencies, and for-profit companies. The California State VOAD is comprised of two regional VOADs and many local VOADs in California. Click the map to find one active in your area. Benefit from the accumulated expertise of VOAD members throughout the state. 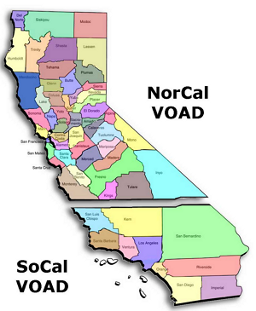 How is VOAD Organized in California? Due to its size and geography, California is home to two regional VOAD associations—NorCal VOAD and SoCal VOAD which share the California State VOAD seat at National VOAD. Each strives to include all the nonprofit organizations, government agencies, and for-profit companies that provide or coordinate disaster-related services in its service area. 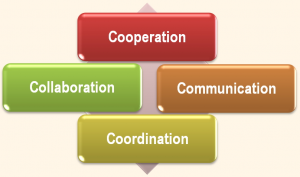 A VOAD association enables its members to share information and coordinate the deployment of resources to improve outcomes for people affected disasters. The development of this website was funded by CaliforniaVolunteers.